Schlock Treatment: 4th January 2008: Mexican Wrestling Mummy double! 4th January 2008: Mexican Wrestling Mummy double! In the Big Book of Mexican Masked Wrestlers, El Santo – the Man in the Silver Mask – will always take up the most pages. It’s a national obsession with a wrestling icon who’s been dead for over twenty years, and in a country which venerates its grappling heroes’ righteous battles with the forces of darkness, El Santo, the Man in the Silver Mask, has sailed as close to Sainthood as humanly possible. Which is not to say the Mexicans are po-faced about their wrestling movies. It’s pure pulp as opposed to high art, as any populist, escapist fare should be; speak to any self-aware Mexicano and they know their local hybrid of wrestling, science fiction, horror, gangster and B-serial melodramas is silly, not to mention bizarre, occasionally crossing the border into surreal. 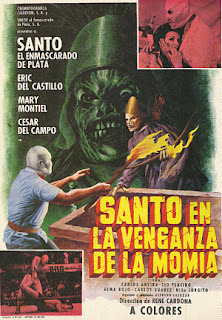 Santo In The Vengeance Of The Mummy, one of more than fifty Santo adventures, is the first Santo we’ve shown in colour, and the first in its original Spanish with subtitles. It’s not the first time Santo goes face to face with an Aztec Mummy, however, and it won’t be the last – Mummies are a mainstay of Mexican filmlore, starting with La Momia Azteca in 1957, and like every other masked wrestler, even the Mummies of Guanajuarto get their own series in the Seventies. Our intrepid luchadore joins Professor Romero’s expedition deep in the swamp-infested jungle to find the Treasure of Nonoc, Prince of the proud Opache people. Along for the ride is eccentric professor Jimenez, a glamourous photographer, a secretary, a cook who looks like Chef Boyardee, with Santo bringing the necessary added muscle. And the expedition needs it: their reluctant guides are superstitious turncoats who believe the Opache superstitions about the immortal mummy of Prince Nonoc, interred alive for violating the sacrificial virgin Luha, forever guarding the treasure, and for the guides’ stupidity, Santo needs to regularly beat them into submission. Mexican Mummy films are a genre unto themselves, and it’s often the case of “you’ve seen one, you’ve seen them all” with the same back-story of forbidden love and curse of immortality. But Vengeance… actually fiddles with the formula, and instead of the wide-eyed, shaggy-haired, ever-grinning mummy from earlier films, we get one that looks like a walking mudcake in a bishop’s hat. As dumb as it sounds, when the mudcake is bathed in red gels clutching a bow and arrow, it’s a memorable, if minor, moment in Mex-Horror. Santo films began to suffer from the late 60s onwards from downward spiralling budgets and, to be fair, a limited pool of worthy adversaries. In colour and under its glaring lighting, the seams are starting to show in uncomfortable closeup, so you can really tell that machete is plywood painted silver. 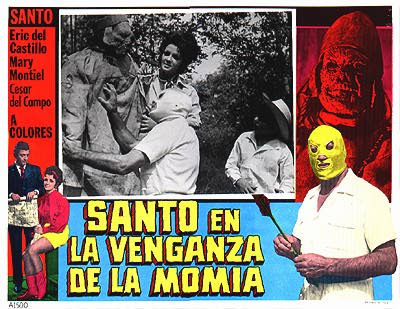 But there’s lots to like about Vengeance… It’s superbly bookended by two extended – and I mean extended – wrestling matches, there’s the twang-crazy throwback surf soundtrack, and I believe a Santo first, at least for Schlock Treatment: a quasi-romantic subplot with foxy photographer Susana. 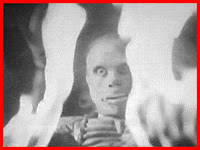 The two suffer from relationship interruptus thanks to the walking corpse, although they evolve into surrogate parents for the orphaned Agapito, played by Santo’s real-life son Jorgito. He later wrestled (and still does) as El Hijo del Santo/“The Son Of Santo”, and, following in his father’s much-stretched tights, starred in his OWN series of movies. As such, this may be the only chance you’ll get to see him minus his mask as the Son of Santo joins Santo In The Vengeance Of The Mummy. 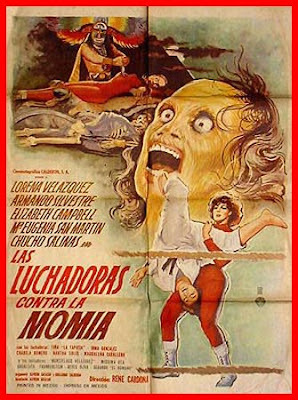 A few months ago we premiered the first Luchadoras film on Schlock Treatment: Wrestling Women vs The Aztec Ape, starring flame-haired US expatriate Elizabeth Campbell as The Golden Rubi, and Mex-horror icon Lorena Velasquez as Loreta Venus. Known as “Las Luchadoras” in Mexico, these two wrestling dynamos took on the brain of an man trapped in a ape’s body – or was it the other way around? Pauly Shore, I’m looking at you! 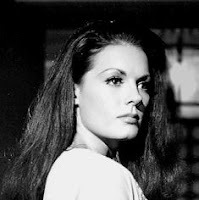 – and was so successful in its American run that K. Gordon Murray bought and dubbed its sequel, the 1964 Wrestling Women vs The Aztec Mummy. “Black Dragon’s Gang Murders Archaeologist!” the headlines scream, as a scientist heads to the Luchadoras’ dressing room for protection. He believes he’s doomed, since his colleagues have been murdered by a fearsome gang of cartoon Asians led by super-villain Prince Fujiyaka – Japanese by name, but he dresses like Fu Manchu, and STILL looks like a squinting Mexican, and a slightly embarrassed Mexican at that. The Prince is picking off those archaeologists who possess the codex, a series of instructions for finding the lost Aztec trasure of Temezoc. The Luchadoras agree to a wrestle-off for the missing parts of the formula, pitted against the Prince’s sisters, a pair of judo experts who are creary no match for our she-heroes (heroines? Or is that “sheroes”?). Once the code is cracked, the trail leads the Luchadoras and the kindly Dr Trelles into the middle of a crumbling Aztec pyramid. Through a lengthy flashback we’re told the story of the virginal Xóchitl, an intended sacrifice to the gods who instead runs away with her lover, the sorceror Temezoc; once discovered, she’s put to death, and Temezoc (or “Pompoca”, since it’s the identical story from the earlier Aztec Mummy series) is cursed to eternal vigilance, keeping guard over her medallion that leads to the hidden Aztec treasure. Loreta and Rubi stumble on the dusty remains of Xóchitl (after all these years her bony maidenhead is STILL being nibbled by rats) AND the mummy of Temezoc, moving, and still mourning his long-dead love. He’s a sight to behold, a wild-eyed, long-haired shuffler (like Margot Kidder in her bag lady phase) whose magical power is in his eyes. Which explains why he doesn’t blink (the lack of eyelids is a dead giveaway too) but doesn’t quite explain why he turns into a vampire bat on several occasions. It’s a wild and woolly attempt at resurrecting the hugely successful Aztec Mummy series from the late Fifties. Regrettably, the only version in circulation has been cut by 30 minutes, with fake surf and rockabilly tunes added in the mid 80s along with obnoxious “humorous” asides. Nevertheless, clocking in at the hour mark, it manages to pile on the palaver, distilling its farcical cliffhanger-like elements to the bare essentials. 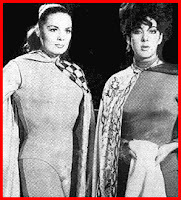 The Wrestling Women returned later the same year in Las Lobas Del Ring/"She Wolves Of The Ring" (1964), followed by Las Mujeres Panteras/"The Panther Women" (1966) minus Lorena Velasquez, and Las Luchasoras vs El Robot Asesino/"Wrestling Women vs The Killer Robot" (1968), with a completely new set of Luchadoras. Unfortunately none of these films made it north of the border, although Night Of The Bloody Apes did, an unofficial 1968 remake of Wrestling Women vs The Aztec Ape. So it’s hola and adios to Las Luchadoras as we ding the bell on their second and final adventure on Schlock Treatment: the 1964 Wrestling Women vs The Aztec Mummy.